Insurance policies and the methods of satisfying claims vary greatly depending on your policy, the insurance carrier, and state regulations. The information provided may or may not apply in every case and simply points out a few key points policy owners should be aware of. Understanding the Policy: Insurance is not designed to rebuild/replace your belongings with cheaper products and then pay the homeowner the difference so you can put it in the bank. If the insurance company saves money it goes in their pocket, not yours. In some cases, the insurance company will offer homeowners a pre-fab home that can be setup in a few weeks. Even though the cost of the pre-fab is half the cost of the original home, the policy owner is made whole and claim is closed. Do not let this happen to you! Homeowner’s Responsibility: Insurance policies have standard language telling the homeowner that it is their responsibility to prevent further damage if they sustain a loss. Example 1: If your home sustains damage from water and steps are not taken right away to prevent further damage such as mold growth, your insurance company may not cover the mitigation of the mold. Example 2: If a damaged structure does not get boarded up and weather causes further damage, or a neighborhood kid comes over to check it out and falls thru the floor, the owner may be required to pay for the additional damage and/or the medical for any injuries. Hiring a Contractor: Some insurance companies have a preferred contractor list which they try to steer homeowners to. 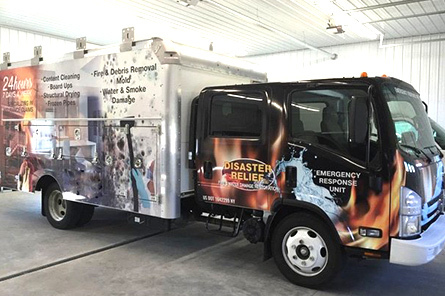 Disaster Relief works for the homeowners directly. We take pictures of the affected areas and look for all the damage that has occurred. We do not take short cuts in the hope that the insurance company will call us again because we saved them money. We do what is best for you, not them. Living expense: This portion of the policy covers lodging and meals when your home is damaged and rendered uninhabitable due to a loss. Contents: Covers the cost to move, clean, store or replace your personal belongings that are contained within the home. A good way to know if it is considered contents or part of the structure is that if you were able to turn your house upside down and shake it, everything that falls out of it would be contents. ACV vs RCV: Your policy will either cover Replacement Cost Value (RCV) or Actual Cost Value (ACV). Replacement Cost Value (RCV) is a term used by the insurance industry to replace what was damaged with the same quality and quantity that was there before the loss. Example ACV vs RCV: If you have a shingle roof that has a 20-year life and you have damage to it when it is 10 years old, then the insurance company will only pay for half of the cost to replace it. However, if you have an RCV policy initially the insurance company will only pay half, but after the work is completed, you may submit the receipt to the insurance carrier for reimbursement of the other half.